Bolton Garage Door Repair specializes in residential services. Whether you need urgent repairs or experts in overhead door maintenance, we are the company to trust. Our ability to do any garage door repair work fast and properly install new openers and doors makes us the best choice for any service in Bolton, Ontario. We serve local residents and respond as fast as possible. With equipped vans, trained pros, and years of experience in this job, our team guarantees expert work every time. There are only friendly faces on our team and each technician is updated, licensed, certified, and qualified. These are required qualities in our line of job and the reasons why you should trust any garage door service to us. When you have any trouble with the way your overhead door performs, ask us to troubleshoot. We utilize our experience and knowledge in order to diagnose problems and do so as fast as possible. Snapped cables? Opener problems? Broken spring? 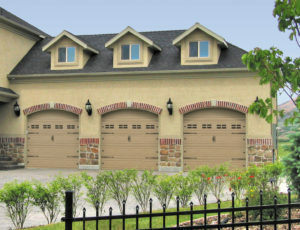 All you have to do is call our garage door company and let us take it from there. We can repair any garage door and its parts. And we can fix any problem once we diagnose it. Troubleshooting is always part of our job unless you only need us to replace the broken torsion spring. When the door doesn’t close or open right, our job is to find out the reasons why. This is what makes our work effective. We don’t leave any problem without fixing it down to the last detail. Whether solutions require the urgent replacement of the snapped cable or the alignment of the tracks, the service is done in no time. If you ever have spring issues or urgently need garage door opener repair, you can rely on us. But the job of our Garage Door Repair Bolton team doesn’t end here. We are also available to order & install new garage doors and openers for you, maintain them both, offer solutions, lubricate and make adjustments, and take care of any concern and need our customers might have. So do call even if you have one question.